My email inbox includes a folder titled “Creepy Email Marketing Messages”. Soon I will have enough to compile for a charmingly dark listicle. I’ll call it “75 Times I Was Stalked By A SaaS” or “Tinder Message vs. Follow Up Message – What’s More Pervasive?” Something like that. Why is copy becoming creepy? 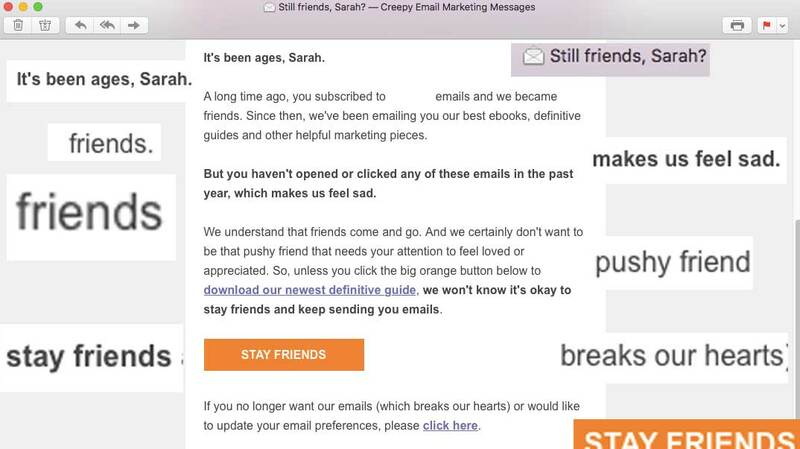 When did digital marketing copy get so creepy? My theory is that somewhere along the line, Henneke Duistermaat told us to write conversationally to “engage and delight” our users, and we took it a little bit too far. 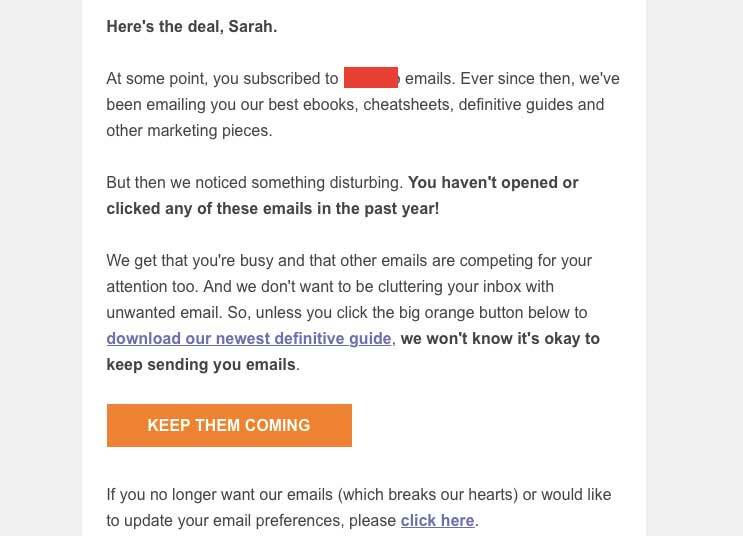 It’s like that Amy Schumer “Hello M’Lady” skit, only the feeble attempt at seduction here is to coax us out of our free CRM accounts. Don’t get me wrong, I am all for sidestepping stuffy jargon with an upbeat, conversational tone that really delivers the goods. Google concurs. It’s useful for users, so it’s valuable for business. But instead of going into super buddy-buddy, palsy-walsy, oh-em-gee u r like my best fwiend or possible lover territory, why not do some actual time on the floor, researching the language and tone of your warm-blooded, real-life customers? Doing so will help your content sound more authentic and make room for trust. And trust is the gateway to winning prospects. Depending on where your audience hangs out online, you may need to go incognito on Instagram, Facebook, Twitter, LinkedIn, Snapchat to get a sense of how they speak and engage online. Read and record the phrasing used by reviewers on Google My Business profiles and Facebook Pages to describe their experiences with competing companies. Assess the comment style used on Instagram account posts of similar or related brands. Look for commonly used slang, greetings, and references. Take note of posts that receive more attention (such as in Facebook Likes and Shares) over others for intel on popular content types and delivery methods. If your customer base is limited to a specific geographic region, dive into the web properties of the Chamber of Commerce, local businesses and sports teams to get a sense of overarching local tone and values. I find the reviews by real-life customers of competing companies (or even those of similar companies in non-competing geographic regions) are most reliable for gaining a general candid sense of the personalities of a particular audience. ***TIP: Check out Bloomberry, a new tool in development by the folks at BuzzSumo. Bloomberry makes it easy to mine reviews based on your keyword search for just about anything, and aggregates results from all over the web, including forums, Reddit and Q&A sections in e-commerce sites. It’s a great research tool for gaining a sense of your audience’s questions, concerns and approaches to resolution. And if you’re ever in doubt, it doesn’t hurt just to ask your customers what they would like to see from you in terms of content and correspondence. We have data guys in our office – really, really smart data guys. The things they uncover about our audience through analytical research are exciting and useful. I bow down. It is on my list this year to further my education in Google Analytics and get on maybe the first step of their level. Getting their opinion on how our audience behaves is essential because they can tell me a lot about how people respond to our website, paid advertising and social media efforts. But it’s also a good idea to talk to the people who are really talking to the people – your customers. That might be your service reps. That might be your project or account manager, or your sales lead. Whoever it is, take him or her out for coffee immediately. Ply them with $6 espressos, artisanal vegan biscotti or whatever it takes to get some insight into the feedback, concerns, and personalities of your customers. And keep it going. Help your front line establish a process for organizing communications so you can mine frustrations, compliments, and questions from your customers over time. There are a hundred ways to ask, “Would you please consider reading our latest e-book?” How can you say it in such a way to get a positive response from your customer? Some of the marketing copy I see out there is getting so far to the point of cutesy that it reads as condescending. Like, because I haven’t opened your latest ebook, that makes you feel sad? Stakeholders should have a huge problem with this. Do not talk down to your audience. Do not falsify the aims of your campaign by guilt-tripping your prospect. It’s unattractive in its dishonesty. If you don’t have a sincere sense of empathy (or, you are too lazy to invoke it), you are going to make your offers sound cheap. No person is going to feel affected by your “sadness” over the e-book he or she didn’t open. I promise. There is a reason why I don’t write as much for the Navigator blog and our clients. It’s because I’m a full-time project manager now and I simply don’t have the bloody time! Meaning, I don’t have the bloody time to do it right for every project. So I have to be selective. Do the research (this takes solid time, depending on how familiar you are with your audience, to begin with). Grow some bones (a.k.a. the beginnings of sensible words). Feel mistrustful of bones, so get up and walk anxiously around the office building while listening to Beach House with sunglasses on. Attempt to mend bones at the computer, while sinking into a shallow grave of self-loathing. Wake up at 4 AM with all the answers, hopefully. Distract oneself with a different project and then suddenly have it come flooding towards you. Run it through Hemingway App, Grammarly, and the five people in the office you bombard at 3 PM. When you take the time, it can be freakin’ hard, but the end result is good human work. Like an actor who invests in researching the character and become the part by living in it for weeks at a time, a good copywriter pits in for the long haul. And it shows on the page. When the subject line reads “I see you…” (for real, I received this in a sales-y message from an extremely popular SaaS company, seen above), I have to wonder: do you really see me? The real me? Not the one whose clicks you were impressively able to track while I was on your site – I mean, the person who likes spin classes and dogs and researching the size, wash and fit on at least five e-commerce websites before committing to buying a pair of jeans. Do you see her, do you know her? Do the research. Put the time in. Get to know the real people.